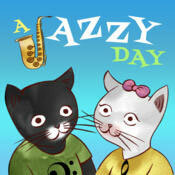 A Jazzy Day is the perfect app to open the world of musical appreciation to your kids. This app was made for little fingers. Kids can easily manipulate and explore instruments and their sounds. This award winning app is presented to us by The Melody Book and created by professional music educators. The interactive story can be read alone or ‘Read to Me’ is an option for younger kids. The music instruments featured in the book include: Bass, Drums, Guitar, Piano, Vibraphone, Trumpet, Trombone, Alto Saxophone, Baritone Saxophone, Tenor Saxophone, Flute, Clarinet, and Conductor. On the Learning Page, each can be heard, enlarged, and rearranged. Check out the videos below for a sample of A Jazzy Day in action. This high-quality app can provide hours of playful education during the summer break. 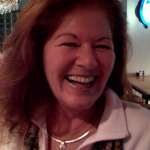 Read About A Wonderful Adventure! Can You Guess Which Instrument? What was the original inspiration for A Jazzy Day? 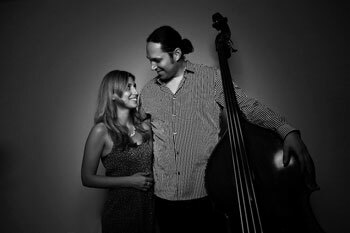 The Melody Book was founded by software developer Dana Morgan and jazz musician Daniel Ori. Our mission is to educate children about what we know and love the most, music! With A Jazzy Day, we set out to introduce kids to jazz music and create a positive impression of this beautiful music from an early age. Through sound, color and interaction, kids join the kittens and discover the different instruments of the jazz big band. Our favorite aspect of the app is the story itself, and in particular, the section where the dad explains about the different sections of the Jazz big band. In the end, kids get to meet the musicians and listen to the full big band swinging and playing a tune. We’re excited to announce that A Jazzy Day is available and on the new Apple TV App Store!